Day of the Dead Stickers, Shirts and More! Dia de los Muertos celebrations start HERE! 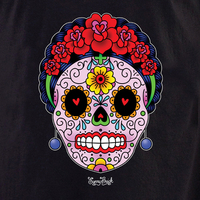 Sugar skulls and more, in stickers, keychains, patches, buttons and shirts, by artists like Sunny Buick, MLuera and Agorables. Retail customers--thank you for shopping here!